If you are experiencing discomfort at your computer workstation, notify your supervisor to determine available options within your department (different chairs, keyboards, document holders, etc). Furniture and equipment purchases are the responsibility of your department. After completing this free online training, you will be able to set up and adjust your own workstation. Refer to our Healthy Workstation Guide to reinforce the information presented in the online course. Contact the Ergonomics Support Team if you require more information or have other ergonomic concerns. A team member will contact you to provide recommendations. 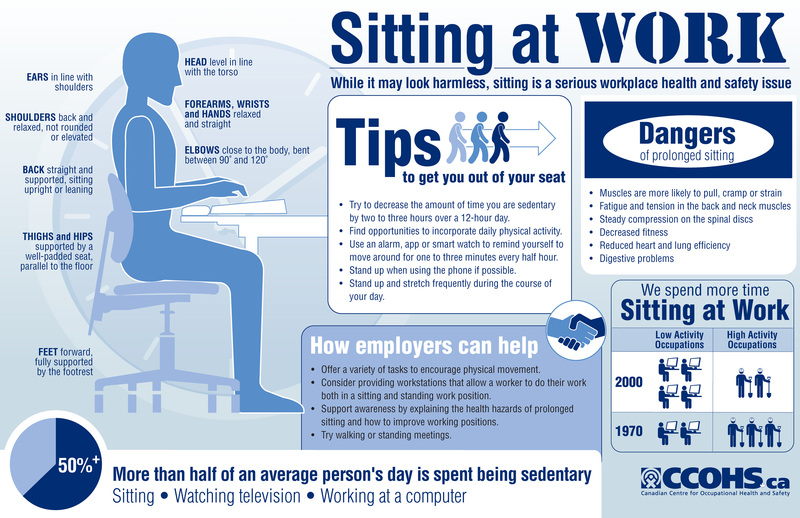 Even with the best workstation equipment and setup, working for long periods at a computer can cause fatigue and discomfort. Doing a simple set of stretches can go a long way to alleviating fatigue and reducing muscle discomfort. Note: Moving very light items (less than 0.5 kg) is not generally considered material handling unless the task frequency is high.